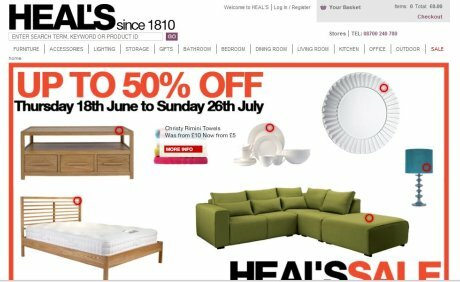 Furniture retailer Heal’s relaunched its website recently, working with 10CMS and Venda to increase the company’s online sales. First impressions from the Heal’s homepage are positive, as it has a professional look and feel, as well as being well laid out in a way that makes it easy to scan and understand the page. At the moment, the sale display dominates the homepage, showcasing a selection of reduced products. One nice touch is the use of hot spots, which customers can mouse over to get details of the product, with the option to click through to the homepage for further information. Heal’s has placed it on the left just under the logo. against a white background, and is overshadowed by bold Heal’s logo. put it at up to 30%, while this study of niche sites puts the figure nearer 5%. few people use it, it does indicate greater intent to purchase. Thankfully, Heal’s has some good filtered navigation options to trim these 200 results down to a more manageable number, allowing users to refine search results by product type, material, colour, size and price range. The product pages do a decent job of conveying essential information to customers; delivery charges, details, dimensions etc, and there are user reviews on some pages to help further, while the related and matching products offer useful cross-selling options for users that venture below the fold. The quality of product photos varies around the site. The page for the sofa below has a good range of views and you can zoom in and out but some products, like this Teak table priced at £525, have much more basic images which don’t allow customers to see much detail. Since it is the most important link on the page, to get customers into the purchase process, the checkout button could be made to stand out more than it does. Heal’s doesn’t insist on registration before customers enter the checkout, just an email address. It asks for a password after customers have entered their address details, so this is a smooth and unobtrusive way to handle registration. While there is nothing fundamentally wrong with the checkout process, and data entry is easy enough, I don’t think that Heal’s has made it as smooth as it could possibly be. Even though it has been split over five pages, there is still a lot of scrolling to be done, thanks to the fact that the page header, navigation bar, and order summary image take up much of the space above the fold. There are some good features within the checkout though; help and information is readily available, both in the form of links and a contact number which is displayed on every page in the site, as well as Verisign logos and other such reassurances about site and server security. Heal’s relaunched site is easy on the eye, and contains a lot of useful features. The hot spots are a great idea for instance, but could be used to better effect by using them more around the site, or displaying more photos with suggested room layouts where customers can click on individual products. The site works well overall, navigation and sorting options are useful, which help and information such as contact details is readily provided to customers. Though conversion rates have improved, I would suggest that Heal’s takes a look at its checkout process and considers a few tweaks. I have seen much smoother processes in other sites I have reviewed recently, such as The Book Depository, which manages to achieve everything in one page. London-based startup Songkick has just launched its social network for gig-goers, which lists a million gigs, new and old. 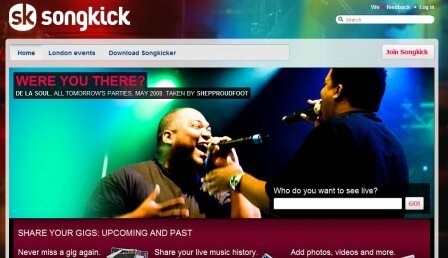 The Songkick site is a database of concerts and tour histories crawled from around the web, so users can not only see upcoming gigs, but add pictures, ticket stubs, and review and reminisce about their favourite concerts. Fashion retailer Oasis launched an iPhone app this week, which allows shoppers to browse through the latest outfits, read the newsletter, and find your nearest store. I was asking which UK retailers have mobile commerce sites earlier this week, and didn’t manage to find many examples. While this app is not quite an m-commerce site, you can select items on the app and pay via the main site. Sky News launched an iPhone app this week, which provides the latest headlines, as well as encouraging users to send in their own reports and images. The app, which is currently top of the free download charts in the App Store, also has a strong focus on video content. I’ve been seeing how it compares to rival ITN’s version.